This is a little off of my typical topics, but fits nonetheless. I am honored to have had a novel dedicated to me. 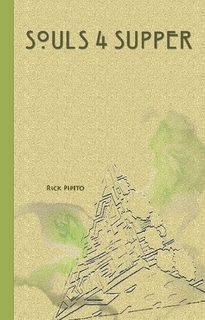 Author, Rick Pipito, has dedicated his newly released horror novel, “Souls 4 Supper,” to me and www.homemadedelish.com. It is the 4th entry in his series (“Flesh and Leftovers,” “Blood, The Second Helping,” and “Bones At Breakfast” are the three that come before it), but it is the first of a new trilogy. The good news is that you can start reading book 4 and not feel like you are lost because it acts as a standalone trilogy. Of course I recommend all of the series as they get better as they go. Even better yet is that a third of his profits for the month of November are being donated to the American Red Cross for Hurricane Sandy relief funds. If you are a horror fan, or just love a good read, check it out. They are available in print forms here: http://www.lulu.com/spotlight/rickpipito or you can get them for your kindle at www.amazon.com. Also, for more information, be sure to check out his site: www.rickpipito.com. One final note, my husband may have written it, but the fantastic artwork is done by my brother-in-law as well. thanks for the plug 🙂 Hope everyone enjoys!